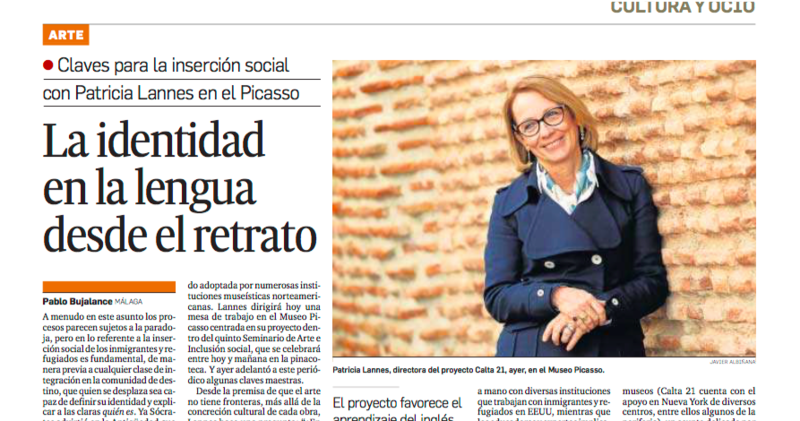 Two Spanish newspapers, Málaga Hoy and La Opinión de Málaga, reported on the V Seminar of Art and Social Inclusion hosted by the Museo Picasso. At the seminar, Patricia Lannes, Director of CALTA21, was invited to present to an audience of 27 museum professionals from across Spain. The seminar focused on community engagement and the ideation and management of user-centered design initiatives, driven by the principles of social inclusion and relevancy. Workshops were conducted by Emanjane Avery, Director of Education of the Victoria and Albert Museum, London, Monica Hoff, Former Curator of the Mercosul Biennial, Brazil and Patricia Lannes, Director of CALTA21, U.S.A. Presenters addressed questions including: Can the arts contribute to social inclusion and full cultural participation? What is the framework that drives programs of social inclusion in museums? What makes them successful? What are the biggest challenges? For immigrants and refugees, their social inclusion is dependent on having a firm sense of the self. *To read the original version in Spanish, click here. “Processes for social inclusion are often tied to paradoxes. It is important that any person trying to become part of a community can define their own identity independent of any type of social integration and geography. For immigrants and refugees, their social inclusion is dependent on having a firm sense of the self. In Antiquity, Socrates said that in order to understand anything, you first need to understand yourself, and this means knowing how to tell your story. This idea, while often avoided, has a myriad of possibilities once it is applied to policy and social inclusion. Patricia Lannes, native of Uruguay and Spanish and French speaker, has worked for decades with immigrants in the U.S., most frequently with those in New York. She has dedicated the past few years of her career to CALTA21, an innovative initiative that uses art and museums as catalysts for learning English. This social action initiative has been used by various museums in the U.S. and has already demonstrated positive results. Today, Lannes will conduct a workshop at the Museo Picasso, using her project as a springboard to address the V Seminar of Art and Social Inclusion, celebrated today and tomorrow in the museum’s auditorium. Museum literacy is a big component of CALTA21, but we are talking about a long term intervention. The second phase happens at the museums. CALTA21 has been put into action in museums in New York City and in its suburbs, but it has sometimes become a delicate issue as some organizations are resistant to participating in this initiative. However, the results speak for themselves. Students improve their English language skills, and especially their oral communication ones. They are also excited to go back to the museum and provide their own curated tour to their friends, classmates, or families. They feel at home and they want their families to be part of this new home. Museum literacy is a big component of CALTA21, but we are talking about a long term intervention. CALTA21 professionals work in collaboration with the professors and museum educators to choose the works of art to use with students, “and language instructors learn how to teach in the classroom using art in a more spontaneous and creative way.” Teaching becomes an artistic creation.